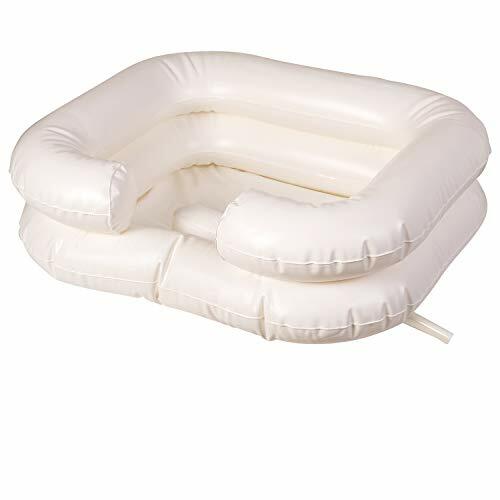 Mobile Salon is an inflatable shampoo station for hairdressers and caretakers alike to provide clean, easy, and professional hair washing in any home or facility. The all new adjustable flaps create even more dexterity to channel water and hair down the drain, or into a container- so there's never a big mess! Mobile Salon can adapt to a large variety of sink or basin shapes, giving users the flexibility for all situations. Mobile Salon inflates in just two quick breaths and is easy to wipe clean so you never have to stop moving! 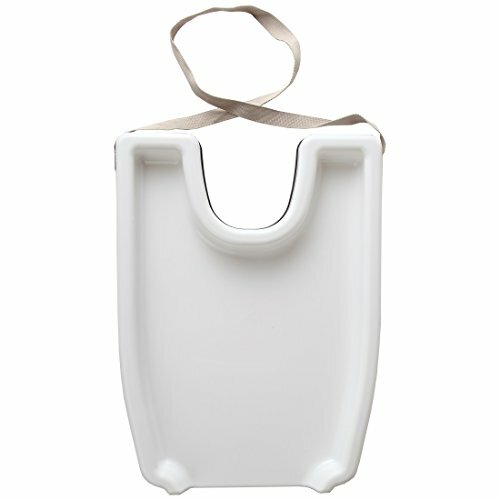 It comes with a handy travel pouch so it can be stored anywhere and quickly thrown in any bag. 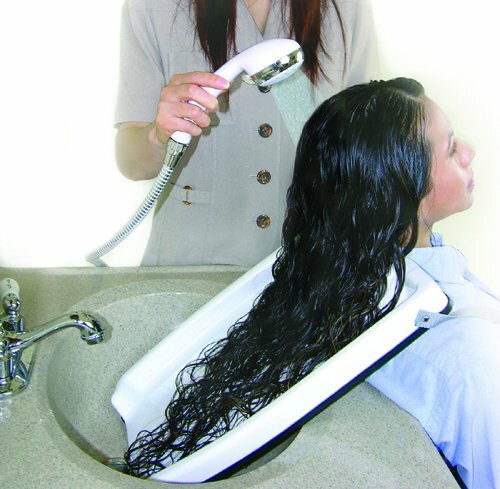 Mobile Salon's design ensures a perfect hair washing experience sitting up or laying down, every single time. Order yours today! User Kim says, "Must have, you've got to get this!" WASH HAIR ANYWHERE: Mobile Salon is perfect for those who need a hair wash in bed or anywhere else. 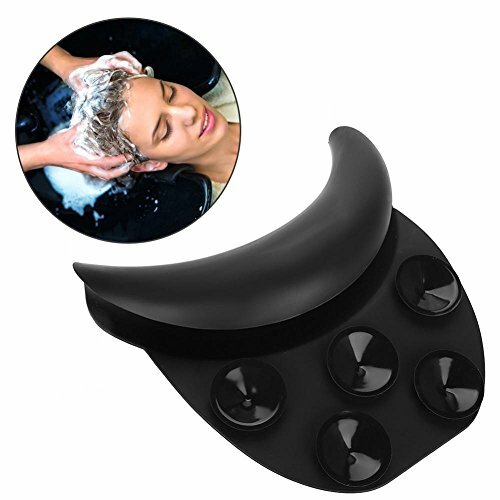 This revolutionary rinse tray is a shampooer for professional stylists, caregivers and more. NO MESS: Adjustable channeling flaps and a grooved design keep all water and hair flowing neatly and down into sink or wash basin. Easy for washing hair lying down; perfect for the elderly or disabled. 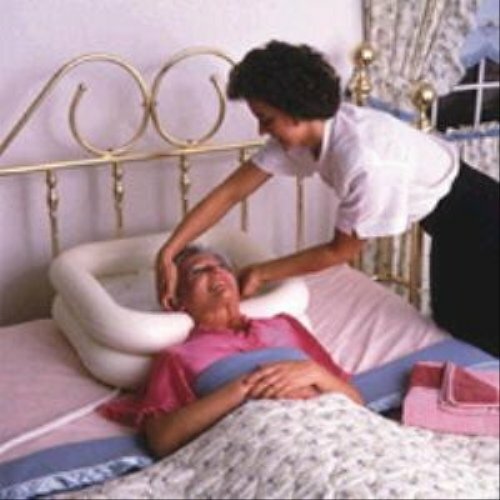 GREAT NECK SUPPORT: Mobile Salon is the most comfortable shampoo basin available. 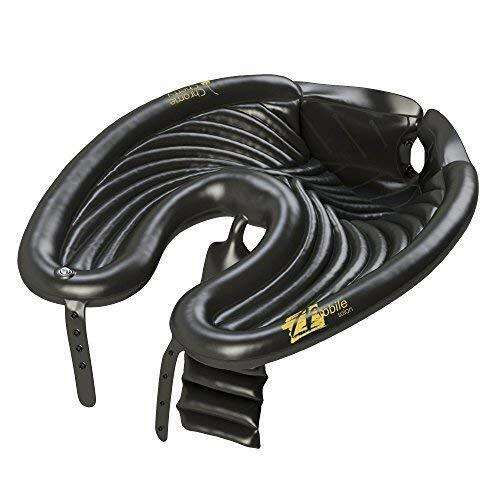 Adjust the comfort cushion contour to the desired neck position for any user sitting, lying down, or in a wheelchair. PORTABLE SHAMPOO BOWL: Mobile Salon inflates with just two breaths and wipes clean in seconds for easy use every single time. Stores easily in your beauty bag or travel kit for easy portability. Shampoo Someone s Hair Right in Their Bed Shampoo someone s hair right in their bed using this handy inflatable basin from DMI;. It s easy to inflate and ready to go when you need it. Plus, it stores easily and compactly when not in use. It has a convenient tube attached so you can drain the water into a large basin or the sink if it s nearby. The bed shampooer is constructed of heavy duty vinyl for durability and is easy to clean. It even has a little built-in pillow for the head! 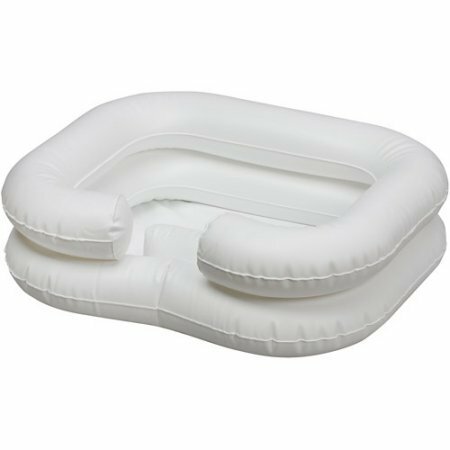 EZ-SHAMPOOis an inflatable basin that allows confined clients to enjoy a refreshing in-bed shampoo. Comfortable and convenient. Hair washing tray. -Durable plastic construction. -Can be used with chair or wheelchair. -Easily cleansed with soap or household disinfectant and water. -35'' Nylon strap wraps around the user's forearm to stabilize tray. -Compact and lightweight to diminish awkward bending for those with limited motion. -Dimensions: 1.75'' H x 13'' W x 17.75'' D.
Brand: HAIR WASHING TRAY | Manufacturer: Jobar International Inc. This lightweight, portable shampoo basin is constructed of durable ABS composite with a rolled edge for both strength and client comfort. The bowl has a large capacity, and measures 20" front to back, 19" across and 9-1/2" deep. It connects to the base with a sturdy steel bracket. The pedestal has a 1-1/2" diameter, chrome metal riser with five legs that form a 22" diameter base. Composite feet/bumpers are included on the bottom of the stand to protect floors from marks. The sink can be permanently installed in a salon, or can be carried to a client's home for portable use (supply your own water source such as a water pitcher or hose, and basin may be drained into a bucket). A rubber plug stopper is included that fits the drain opening at the bottom of the basin, and a flexible, ribbed drain hose (60" long x 1-1/4" diameter) connects to the underside of the basin. Sink is adjustable to accommodate reclining or standard chairs. It tilts front or back and can be raised or lowered from 39" to 55" (measured from floor to top of basin when level). The neck rest dips to as low as 33" from the floor when titled, so this unit can be used with just about any chair. 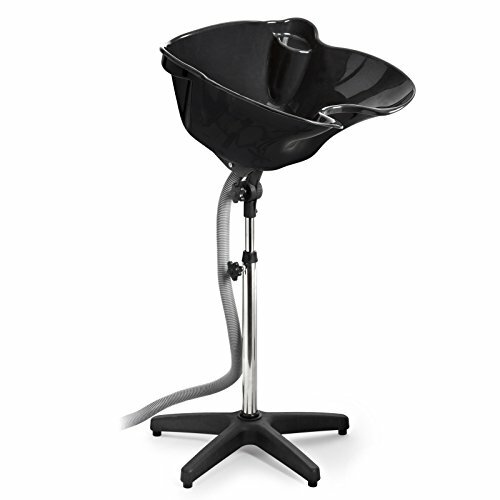 Includes basin with stand (minor assembly required), drain hose, drain hose clamp and instructions. 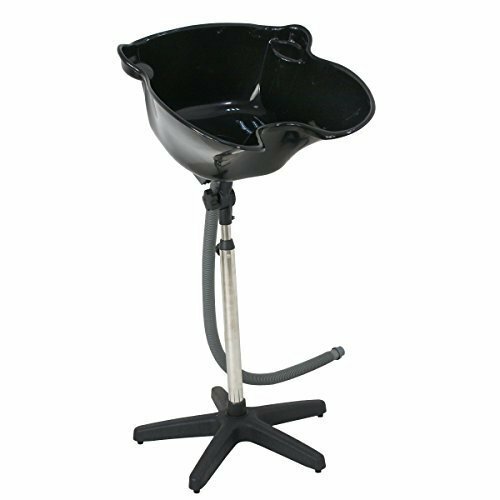 This is our Portable Height Adjustable Shampoo basin with Stand, which is the perfect choice for beauty salons and barbershops for a professional use , It's excellent for extra large capacity. It is equipped with adjustable height and angle to meet needs of different customers . Its excellent portable design allows you to optimize your space. For its comfortably and anywhere with great convenience it also use with wheelchair bound clients, the traveling stylist, home users. 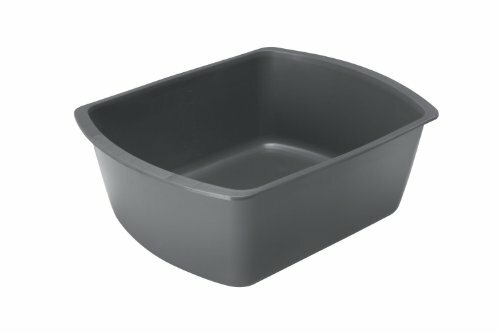 This extra-large capacity bowl is lightweight and economical,also very stylish, yet loaded with professional features, easy to clean and low maintenance. Comes with all accessories and fixtures. Its stain-resistant bowl is constructed from durable ABS composite & Stainless Steel Support Pipe, and the edge is rolled for strength and client comfort, strong pedestal base with chrome-metal riser, composite feet/bumpers on the bottom of the stand protect your floors from marks. The height is adjustable from 37 to 54 to meet needs of different customers;this sink can accommodate reclining or standard chairs and can also tilt completely forward/parallel to its riser for easy storage and transportation. The sink can be permanently installed and used in your salon, and is also portable and can be brought directly to a client's home. For travel use, simply supply a water source such as a water pitcher or hose, and you can drain the basin into a bucket or elsewhere. Great versatility. In addition to washing your feet, you can also use this basin for other small washing jobs like soaking clothes, washing your baby or holding soap and water as you clean your car. 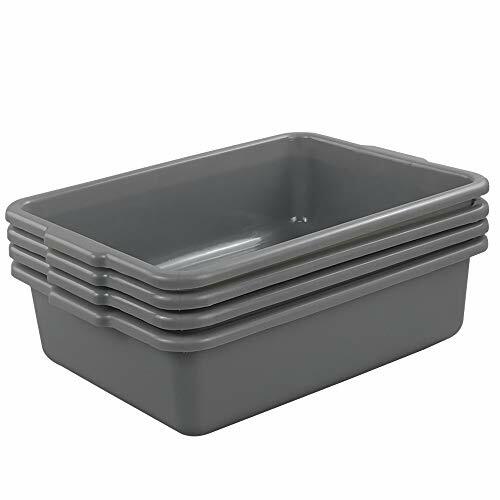 Vakly Rectangular Plastic Wash Basins come in gray and yellow. 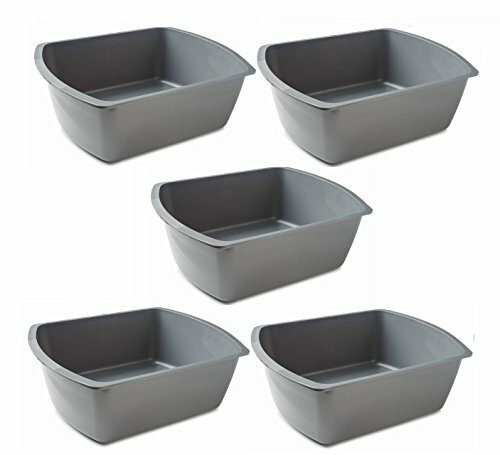 These basin's are 8 Quarts and 13.25x10x4.5 in size and are graduated (up to 7 Quarts). 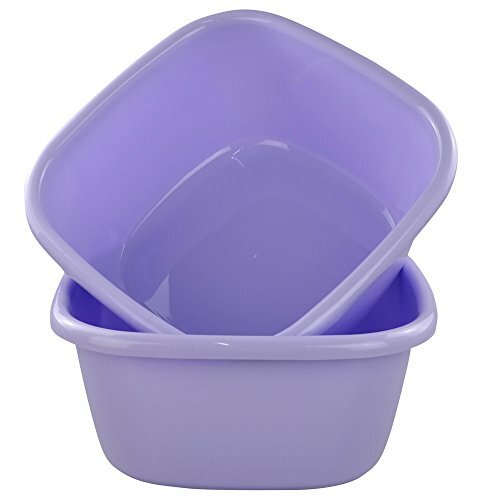 Vakly tubs have a Rolled rim that makes for easy carrying. 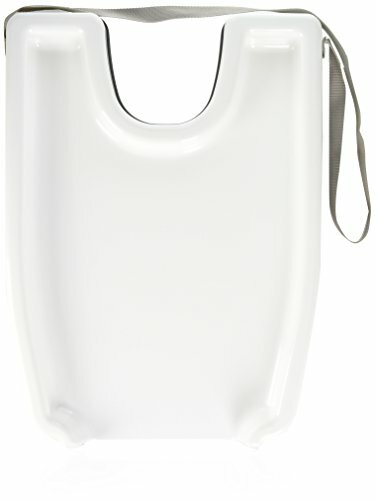 These foot basins are great for limb soaking (feet, face, hands etc.) and are great for performing household tasks like washing dishes, soaking laundry, cleaning and gardening. These basins can fit easily in a standered single or double sink and come in packs of 1, 2, 3, 4 and 10. Great for performing household tasks like washing dishes, soaking laundry, cleaning and gardening. 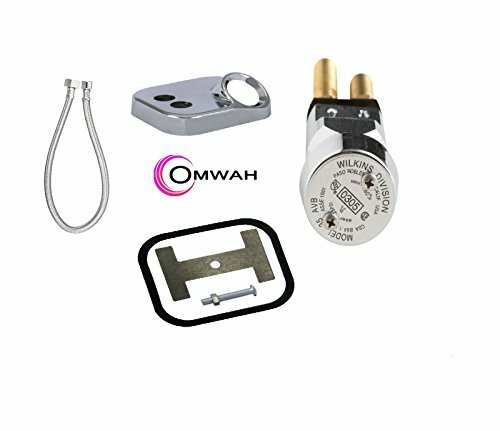 Size 14.8" x 10.8" x 3.9"
This Standard Vacuum Breaker is compatible with most all shampoo bowls and it is a one way value that prevents contaminated water from mixing with the fresh city water supply. This unit prevents perm solution, color chemicals, and neutralizers from going back into the city's water. A vacuum breaker is required in some country based on local plumbing codes. Please consult your plumber for local building codes. Reciever plate, hose, and all hardware is included. Avoids backflow or negative pressure in a plumbing system. simple, fast and comfortable it's head and shoulders above the rest. 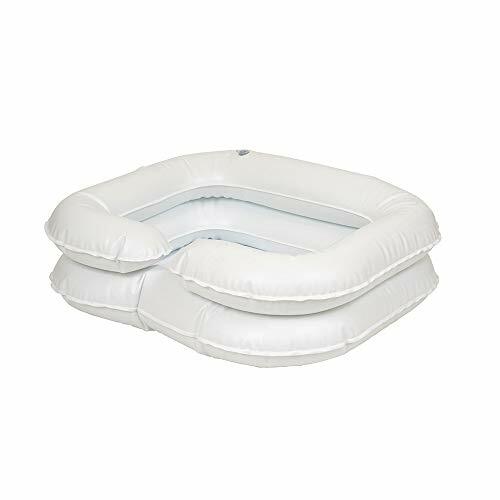 The unique EZ Shampoo inflatable sink fills the need for an easy, refreshing shampoo for patients confined to bed. When inflated by mouth or air pump. It's easy to get - or give - a sink-side hair washing with this shampoo tray. Comfortable shampooing while seated in a chair or wheelchair! It lets you sit comfortably in a chair or wheelchair while your head is supported over the sink by the rounded neck opening. The angled design directs water back into the sink so it won't run down the neck and onto clothing or chair. Raised edge prevents water from spilling over. The person receiving the shampoo will enjoy a relaxing experience. The person giving the shampoo will do so without worry of a mess. Polyester strap (about 35"L) wraps around forearms to hold the tray stable. Durable plastic with nonslip rubber base; about 17 "L x 13"W x 1 "H.
COMFORTABLE AND EASY TO USE: It's easy to get - or give - a sink-side hair washing with this shampoo tray. Comfortable shampooing while seated in a chair or wheelchair! ANGLED DESIGN WITH RAISED EDGES: The angled design directs water back into the sink so it won't run down the neck and onto clothing or chair. ENJOY A RELAXING EXPERIENCE: The person receiving the shampoo will enjoy a relaxing experience. The person giving the shampoo will do so without worry of a mess. MEASUREMENTS: Polyester strap (about 35L) wraps around forearms to hold the tray stable. 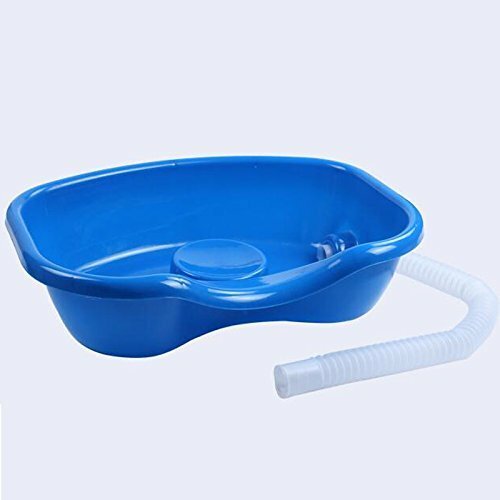 Durable plastic with nonslip rubber base; about 17 L x 13W x 1 H.
Plastic Emesis Basins from Healthstar feature a contoured design that accommodates a patient's neck, making them a good choice for tooth brushing, ear cleaning, and a range of other bedside applications. They are sturdily built and have a smooth surface for easy cleaning. The 500 milliliter large basin has graduated scales marked in ounces and milliliters. Each measures approx. 2 tall x 8-1/4 long x 3-1/2 wide, with a lip. Dimension: 13.6" x 13.6" x 6.5"
Made of Medical ABS PVC, non-toxic, tasteless, odorless, the Shampoo Basin can withstand water temperatures ranging from -40 to 250 degrees Fahrenheit. DESIGNED FOR COMFORT AND CONVENIENCE with built in pillow for the head.